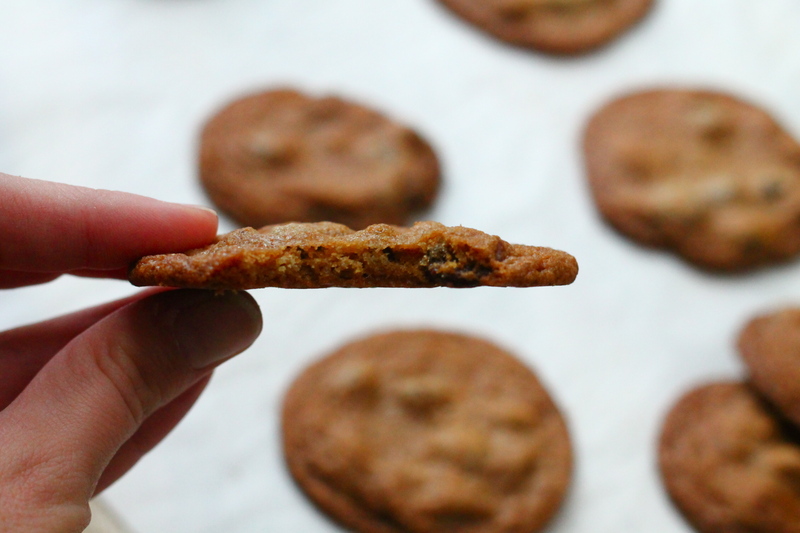 Today is one of my favorite days of the year – reveal day for the Food Blogger Cookie Swap! This is my fourth year participating which just seems crazy. It honestly feels like it was maybe two days ago that I told you all about pepparkakor or like it was yesterday that I sent out my grandmother’s butter cookies. But nope. That was 3-4 YEARS ago. But first things first. Let’s talk about these cookies. You know how there are certain foods that bring back memories? Well, pretty much anything my grandmother Eileen (or as the rest of the family calls her, Mom-Mom) has ever made brings back memories. I mean, I remember most of things I’ve eaten but I also remember the memories surrounding the food. I can remember a random day I stopped by to say hi on my way to the stables and my grandmother made me a little english muffin open faced sandwich with chicken and cheese. So simple but so good. I remember the summer we lived with my grandparents and how on special mornings we would have waffles she had made and how that summer felt like summer camp. I remember the countless dinner parties she hosted, whether just for the huge family that we have on my dad’s side or the annual Christmas party where she cooked for 50 people and made it look effortless. My favorite appetizers will always be the little chips with sour cream, salmon, and capers. I used to just stand by that platter and devour them. Sometimes I would help her serve appetizers and I remember feeling like such a grown up then, even though I was still in my teens. I remember the countless holidays (especially my favorite, Thanksgiving), where the entire family was gathered (all 24 of us) with the turkey, stuffing, mashed carrots (so good), and my absolute favorite – potato pie. We used to get bags of leftovers and mine always had the most potato pie in them. I also remember the first Thanksgiving I didn’t have with family and I got the recipe from her and made it. I remember the chocolate cake with whipped cream that she made for most birthdays, always two layers, and I think the last one I had was for my 18th birthday since I went off to college after that. I remember the first time she taught me how to make biscotti, which is a family recipe going back to Italy 7 or 8 generations I think (I’ve lost count), as well as the little bunnies she makes around easter. There were a few of us cousins crowded around her kitchen island as she showed us and we wrote out the recipes to take home. I wish I could remember the exact day/occasion, but I think it was a “regular” family dinner at her house in Smoke Rise. A few people offered to help prep, cook, or clean, but while she turned down the other offers, she accepted mine. It was the first time my grandmother let me come in the kitchen into “the triangle” to help her at dinner. I remember feeling so excited, honored, and just all around happy. She usually declines the offers for help in the kitchen, whether because she’s already prepped everything and there’s nothing left to do or because it’s nice when it’s peaceful in the kitchen (I’m the same way – I just like to do my thing and zone out). But that day, I got to start coming into the kitchen to help and I felt like such a grown up. That was probably one of the best gifts ever. The point of all this is – I remember. And while it’s been a few years since I’ve celebrated Christmas with her (She and my grandfather moved down to Florida and then a year later I moved to California and couldn’t go down to FL when I only had 6 days for Christmas vacation), I remember all the Christmas traditions. 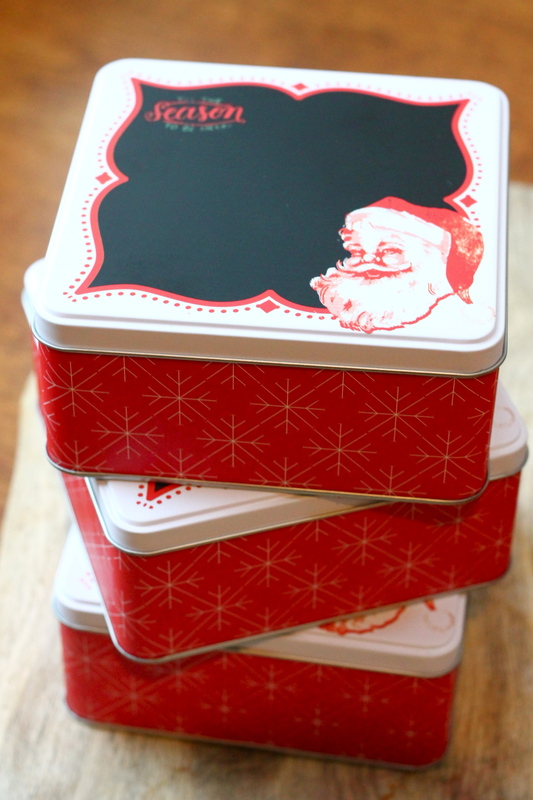 I kid you not – there were tins and tins and tins of cookies. Not like the tiny tins you ship in the mail, but the kind of tins that I could probably stuff a younger cousin into. We had tins of the family biscotti recipe (probably the one thing I will never share on this site, sorry! ), the butter cookies that I made for the FB Cookie Swap two years ago, something we called “Grandma’s Cookies”, a few other kinds, and then her chocolate chip cookies. 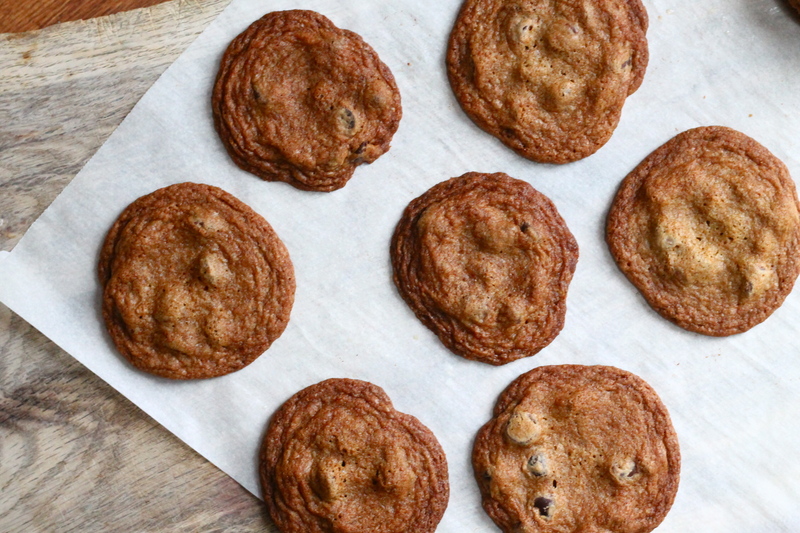 These weren’t your typical chocolate chip cookies. They weren’t soft and chewy and really only good the first day or two out of the oven. 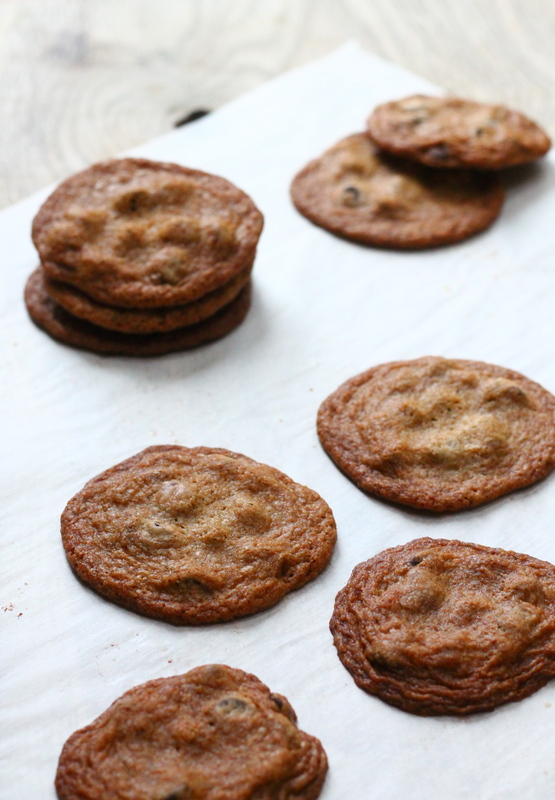 Nope, these were buttery, filled with flavor from the caramelization of the brown sugar, crispy, and somehow the chocolate chips stayed kind of soft. They melt in your mouth and it was so unlike any other cookie I had had. We really only had them around the holidays when my grandma would make up a huge batch of them and serve them at dinners, parties, gift them to friends, and STILL have some left over. They last for weeks and taste just as delicious as the first day (though I think they’re even better days later). I’ve never made these cookies before so I made a test batch, experimenting a little with baking time as well as storing them in a zip lock baggie and tasting a cookie each day. I wanted to make sure that if I was sending a cookie, it would taste as good on the day I sent the cookies as well as the last day that the bloggers would eat it. 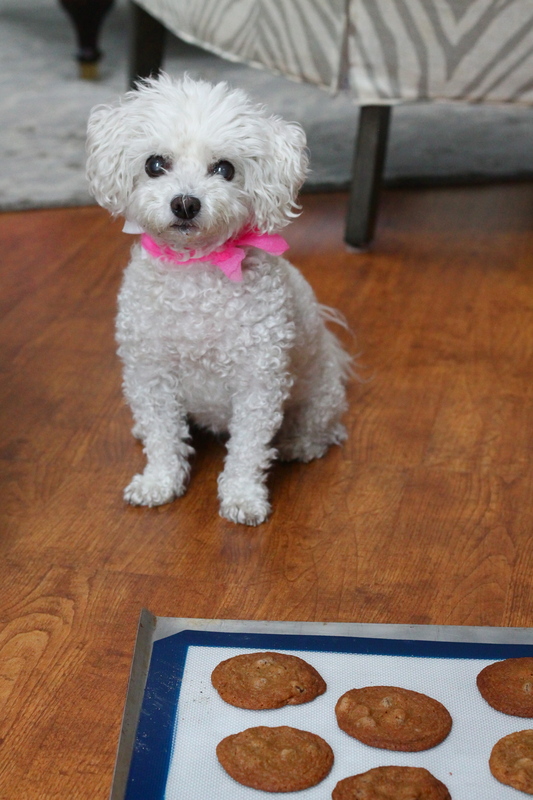 There’s nothing worse than getting a cookie that’s in crumbs and tastes a little stale. I can tell you – these passed the test. So much so it was really hard to leave the few remaining cookies alone. 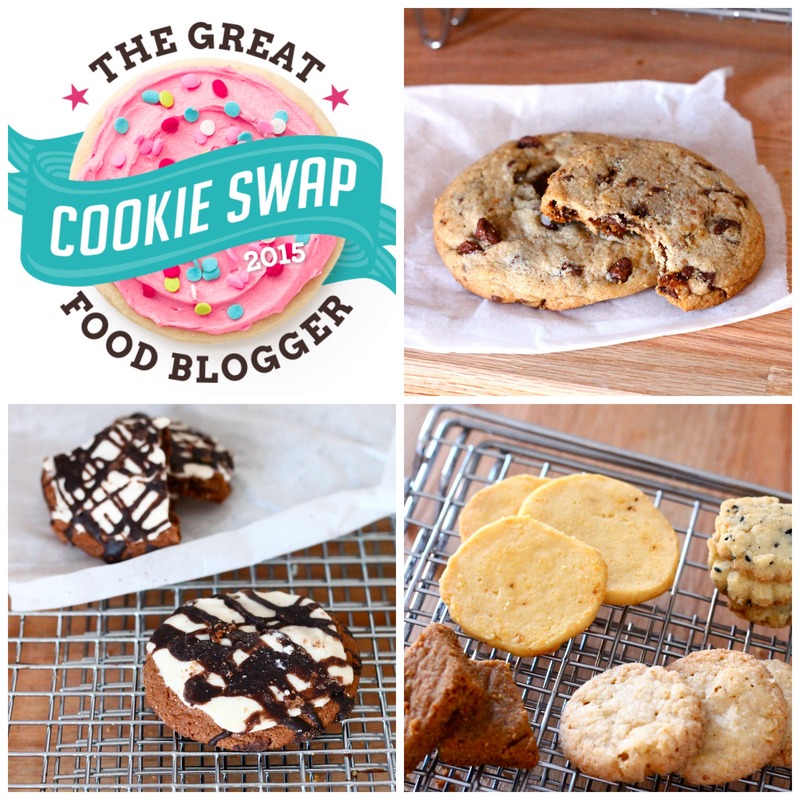 This year I was so excited to be part of the Great Food Blogger Cookie Swap AGAIN! This year, there were 475 people participating (that’s a lot of cookies!) and between us and the brand partners, OXO, Land ‘O Lakes, and Dixie Crystals, we raised over $7,000 for Cookies for Kids’ Cancer! It’s such a fun way to raise money and get to eat cookies at the same time. 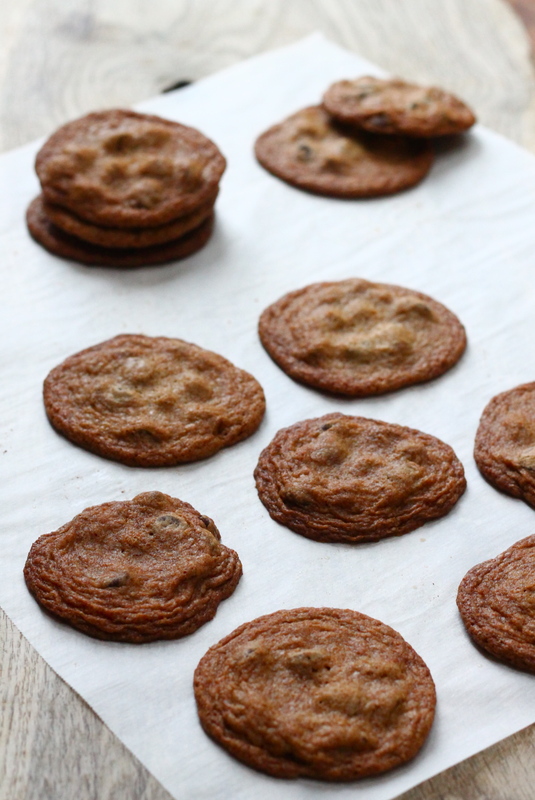 I got to send off my cookies to three wonderful bloggers – Shannon from The Mommy-Files, Kayla from Life, Cake, and Whimsy, and Patti from Cooks Recipe Collection – and I really hope they enjoyed them. In return, I got cookies from three other wonderful bloggers! I got these delicious Espresso & Chocolate Chunk Cookies from Rebecca at DisplacedHousewife, Peppermint Pattie Cookies from Elizabeth over at It’s Good to be the Cook, and then I got an assortment of cookies (black sesame shortbread with orange zest, eggnog cookies, speculoos chunks, and cheddar shortbread) from Allison at Fridgg! If you’re participating in a cookie swap with friends or coworkers, or you need a cookie that’s a crowd pleaser – try these cookies. I kid you not – they were my breakfast/lunch/dinner/snack for about 2 days until I got rid of the last 6 or 8 that I had from my test batch. SO GOOD. See? Even my dog wants one. Preheat oven to 375 degrees F. Line baking sheets with parchment paper. Set aside. In a large mixing bowl, beat together butter, granulated sugar, and brown sugar until light and fluffy. Add vanilla and mix until incorporated. Add in eggs, one at a time, mixing between each addition until smooth and creamy. In a medium bowl, add flour, baking soda, and salt, stir until mixed together, and gradually add the flour mixture to the rest of the batter. Once incorporated, add in chocolate chips and mix in gently. 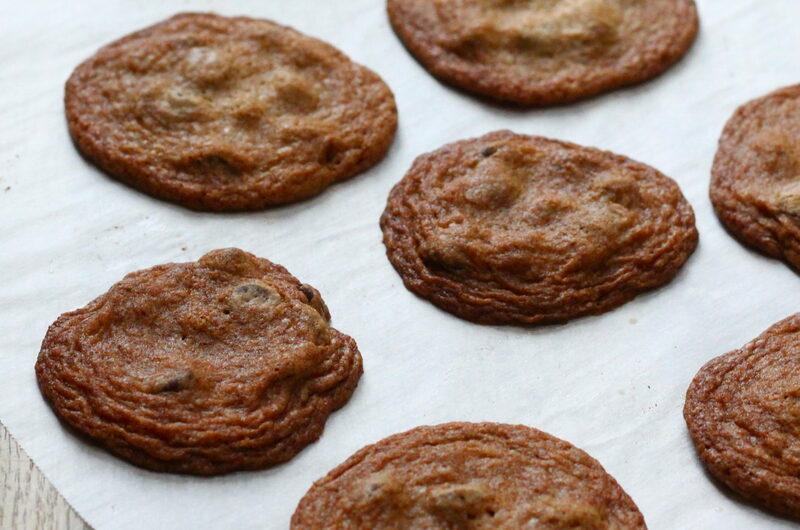 Using a medium cookie scoop or a tablespoon, scoop cookie dough onto cookie sheets, slightly flattening the tops. Place cookie dough at least 2 inches from each other. 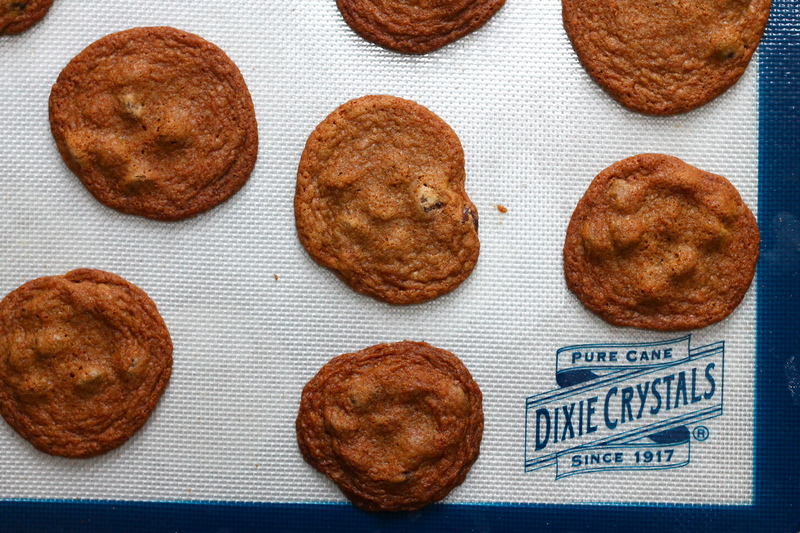 Bake for 12-14 minutes, or until cookies are a dark golden brown and look mostly crispy. Let cool on cookie sheet for 5 minutes and then transfer to a wire cooling rack, letting them cool completely. Store in an airtight container. PPS – I’m totally Cinderella and late to the ball – posting this at 12:10am on Dec 17 when it was supposed to be posted December 16.. Whoops! Yes – they bring back memories! What a special lady she is, your grandmother, my friend Eileen. With tears in my eyes I thank you for this and give you a big kram. M.
My family loved these! I, however, loved the fact that you made this about family even more than the fact that I got to eat cookies!! Since this was my first swap, I was so focused on getting cookies in the mail, that I forgot to include a message about mine. It turns out that my favorite part of the entire experience was getting to know others who love sharing what they know and love, along with the inspiration behind it. Great job! I’ll be looking for you for future events! Oh, and don’t feel so bad about being late. Life got a little crazy for me right after the cookie swap and I only just realized that my recipe never got posted! I have some catching up to do! And I agree – that’s been my favorite part of the swap. 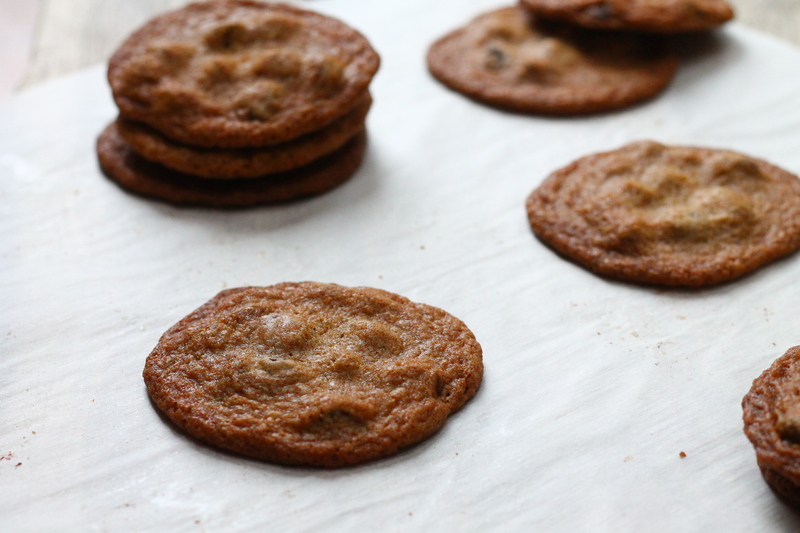 It’s so fun finding other blogs, making new connections, and then getting to read about the cookies and why they were chosen. I’ll keep my eye out soon for your recipe!